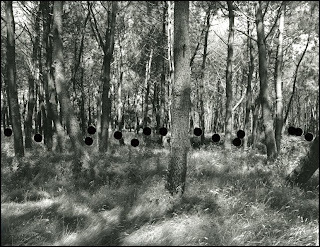 This group of work is based on the historical theme of the hunt and was made using black and white film and a medium format camera. The photographs’ negatives were hole-punched using punches of varying sizes. When printed, the holes let through all the light of the projector onto the photographic paper and come out as absolute black. The intention of this partial destruction of the negative is to subtly break the visual realism of the photograph and point to its surface. The ‘punched’ holes are both aggressive and decorative and create a vigorous visual dance across the image.